... till I'm 30 :P But for now we will ignore that niggling fact and focus on what a fabulous weekend it was :) It really was, I think, the best birthday weekend in quite some time. So that is thrilling. It also means that little Rex spent his first night outside on Friday. We've got the old hutch up against the new hutch in the hopes that close proximity will get the boons used to each other's smells and bond them faster. So far the bonding is going okay, last night we let Rex & Lily spend the night together in the big new hutch which seems to have gone just fine :) We'll be doing more bonding on this long weekend coming up and hopefully by this time next week they'll all be together in the new hutch. I've also designed the wooden levels we need to build, which only Coal & Lily will be able to get up initially ... I figure it'll take Rex about 2 months before he's big enough to jump high enough. 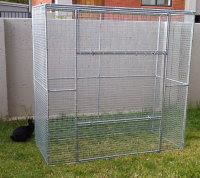 We (Varen) will be building those this weekend too hopefully :) And then the new bunny hutch will be perfect! Yay. On Friday evening BrotherZion came over for a Snoek braai (rather successful taste-wise but damn those bones are irritating!) and to stay for the weekend bunny-sitting for us. I made us all a good breakfast before Varen & I set off on Saturday morning at around 10am. We had a 5 hour drive ahead of us, but it went smoothly and was quite scenic. We arrived at our destination, Otter's Den, around 15h30. 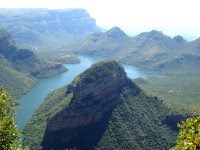 As their website says: "Where the Blyde River meets the Lowveld, near Hoedspruit, Limpopo Province, you will find a small island paradise." I couldn't have been more thrilled with my chosen birthday weekend venue. It's lovely and I'd highly recommend it :) (photos to come later this evening when I've downloaded them). When you arrive, it's not that far from the R527 to Hoedspruit, you park your car and wander down a path thru lush overgrown jungle. I love that feeling of being encompassed by nature. 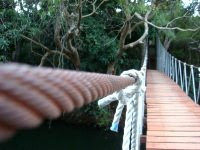 You then reach their suspension bridge (to get across the Blyde River onto the island). My first attempt at this was not a moment of pride - it wobbles, okay ... and I only had one free hand. (Let's just say I'm not terrified of heights ... as long as there's something waist height between me and the drop!) Anyhoo, by the end of the weekend I was crossing the bridge like a normal person at least :) But what an awesome way to arrive somewhere! 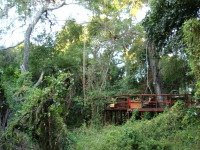 After crossing the bridge you find their main deck area, where we had breakfast & dinner (in the photo above). And then were shown to our room. Which was the very last along the path :) The really nice thing about this place is they only cater for up to 10 people at one time, so it's nice and quiet and private. Our room was on stilts in the forest and we could see a bit of the river a few meters in front of us (where the forest wasn't too thick). We had a lovely 4-poster bed and an outdoor shower - I lovelovelove outdoor showers! Oh, a word to the wise, this spot is not for you if you have *any* aversion to spiders. We didnt' have any problems with spiders in our actual space / room etc. but they are all around you in the forest. 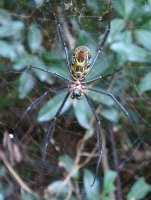 And you notice them because they are golden orb-weaver spiders, pretty large colourful creatures (photos to come, you have been wanred) who spin huge webs! After arriving, before dinner we spent some time watching a quite distant hippo in the river (from the suspension bridge) and doing a walking trail. On Sunday morning, my twenty-ninth birthday, we set out quite early after breakfast and did almost all there was to do in the area by the time we arrived back at 17h30. It was a full day and thanks to everyone for the twitter wishes, the facebook messages and the sms & phonecalls. It was a lovely, lovely day. 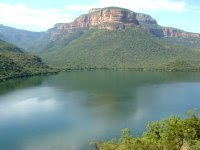 After that we took a drive to the Swadini Dam (which is basically what you're looking down on from the Blyde River view-point). The have a rather hysterical room there with wildlife pictures and whatnot (I assume related to the area), but it hasn't been updated since the 1970's or mid-80's. After that we headed to the Hoedspruit Endangered Species Center (previously the Cheetah Breeding Project). The "shows" run hourly and we arrived for the midday one. It starts with a 20-minute video explaining how the Center started and what they do. I was worried it'd be like the video I watched at Elsamere, but it was far more interesting! And then we went on an hour long "game-drive" thru the area. I put game-drive in quotes because their animals are all fenced and you only actually get to drive inside very few of the fences with the animals (the young cheetahs and the wild-dogs). But it was very interesting learning about their breeding project. Sadly you don't get to even spy on the cheetahs in "the maternity ward", which was a little disappointing. All in all an interesting and worthwhile experience. After that we were quite hungry and tried to find somewhere in the area to have some lunch ... although we only had an hour & half before heading to our next thing. Let me tell you, we should've just stayed and eaten lunch at the HESC. There were 3 restaurant / eating-type places marked on our map and 2 of them were closed :( So we ended up having lunch at a place called the Wildebees Lapa (in Kampersrus). I won't be heading back in a hurry. All I really wanted was a toasted sarmie or something. But they only mentioned that all they offered on a Sunday was a 3-course buffet after we'd ordered our drinks. Now perhaps this would've been fine but we were having 3-course dinners (and delish ones, I might add) at the Otter's Den ... I did not need this for lunch. But we were out of time and options so we had it anyway. And then it was off to the Moholoholo Rehabilitation Center. This was a 2 hour show. It started with a talk by one of the conservationists about what they do which was super interesting as well. I am so against poaching, I can NOT tell you. Is it wrong for me to feel more in favour of animals than people? I dunno, sometimes I feel like it is cause there are so many people trying to help the poor and sick and poverty-stricken people in this world, and really, that does not tug at my heartstrings nearly as much as seeing an animal wounded by man's cruelty. Anyway, this was quite an awesome experience. We got to feed vultures & have them sitting on our arms (they're huge!) and see all sorts of animals, also mostly fenced, except for two baby rhino who were just wandering around who we got to touch. 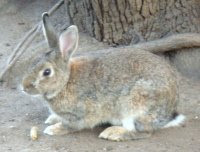 Saw loads of wild rabbits and couldn't believe how like Lily they looked! While there I also had my heart stolen hearing about the antics of a naughty little Honey-Badger called Stoffel. On Monday, after a leisurely morning, another outdoor shower and breakfast, we left Otter's Den and started the journey home. The journey was far longer than it had been on Saturday because we decided to do a little more sight-seeing en route. We took a huge detour via the Blyde River Canyon view-point (and got to see where we'd been the day before) and Bourke's Luck Potholes. Varen had never seen them and I remember them being my favourite sight during a weekend I'd spent in the area with Bean when I'd first moved to Joburg. We stopped for Harries Pancakes in Dullstroom. I'd heard it was the place to go ... but I won't be recommending it to anyone. I dunno if it's just because I make bad choices when too hungry, but I was not especially impressed with my Thai-Chicken (I had quite different expectations) pancake ... shoulda stuck with the spinach & feta one I had originally chosen! Sounds amazing! I would love to go but am PARALYSINGLY scared of spiders. Those guys don't look friendly! Once again, happy b-day. Glad it was a good one. Oh Phil, it sounds simply spectacular! I would love to go there.